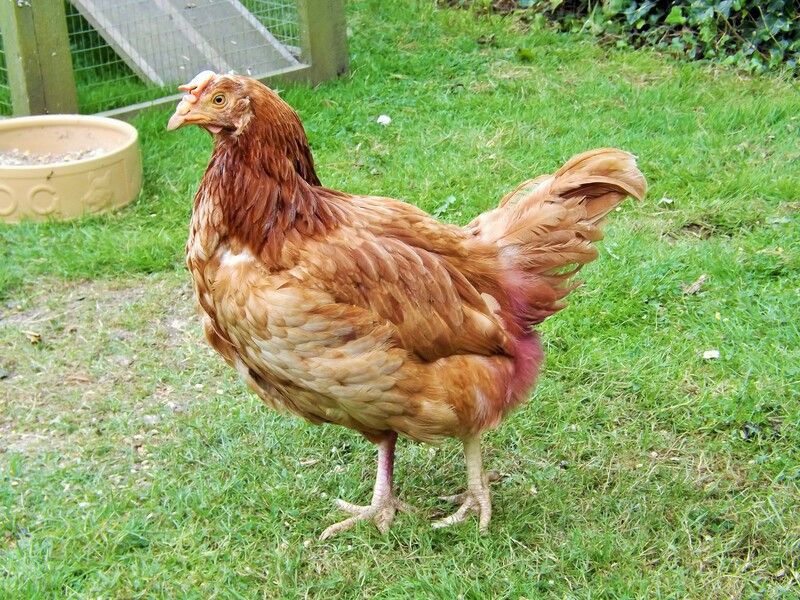 Little Larkspur Chicken arrived to live with us on 16th August, one of three very poorlie girls from a traumatic rescue. She was one of the lucky ones, she survived long enough to be rescued, and along with her new sisters, Lavender and Lupin, came down to Rosewarne for some special care. She was named after my wonderful friend, Liz’s dearly departed ex-batt and I hoped that Liz and her lovely husband Mike could enjoy seeing their girl’s name live on in my Larkspur. Initially, Larkpsur seemed the most healthy of the three girls. The only one with feathers, she set about beak cleaning her two new featherless sisters and seemed quite content with her new life, if a little quiet. She was a gentle soul, she had suffered a great deal in the cages and her new life would take a little getting used to. However, as the two baldies started to develop and blossom, it became clear that Larkspur was not blooming with them. She was still quiet, but hunched and not eating very much. An initial veterinary examination found nothing untoward and Larkspur was given the usual baytril to help kill any potential lurking infection. She was malnourished and, I believe, traumatised from her experiences and I desperately wanted to give her something to fight for; to help her see the wonderful free life that awaited her. She responded well at first and within a week had become the happy little chicken I hoped she would be. She ate plenty, went to bed with a full crop and a mashy beak and tucked up in the nestbox with her new best friend Lavender, whilst self-appointed top hen, Lupin, guarded the door. 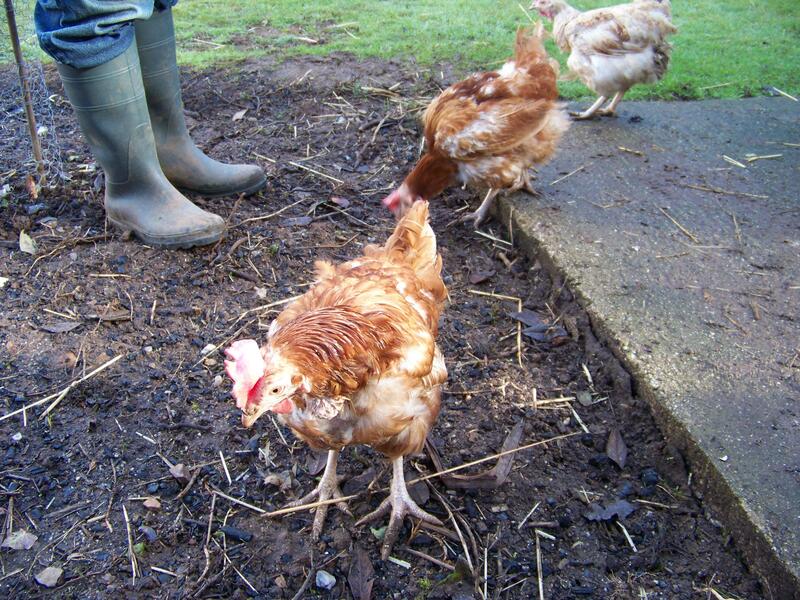 She took a dustbath and paced the fence impatiently in the hope of treats whenever I went into the garden. Things were going so well, that I dared to hope we had beaten whatever it was that had ailed her. However, a few days later I noticed she had become quiet again, she was listless and not eating. So back on the meds we went in the hope that any infection just needed an extra thwack to completely knock it out. 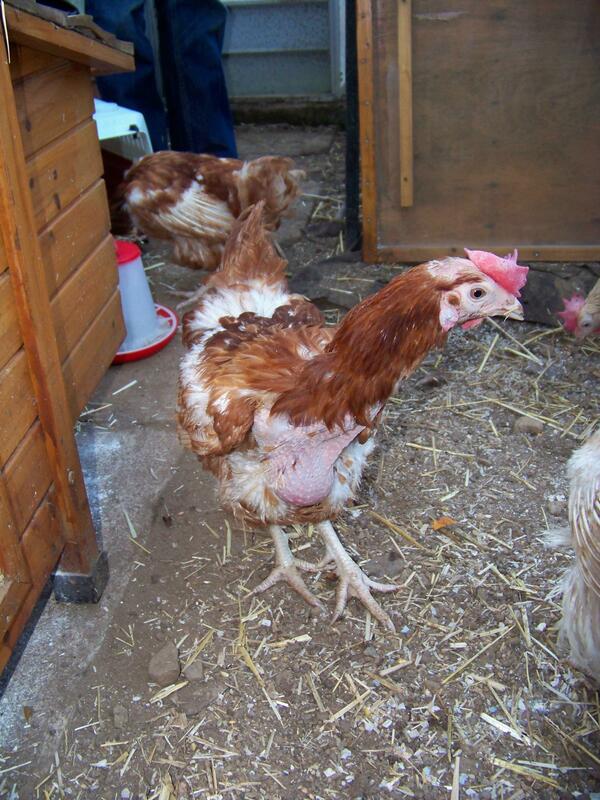 And it did, she was soon back to Healthy Larkspur, doing everything a free chicken should be doing. 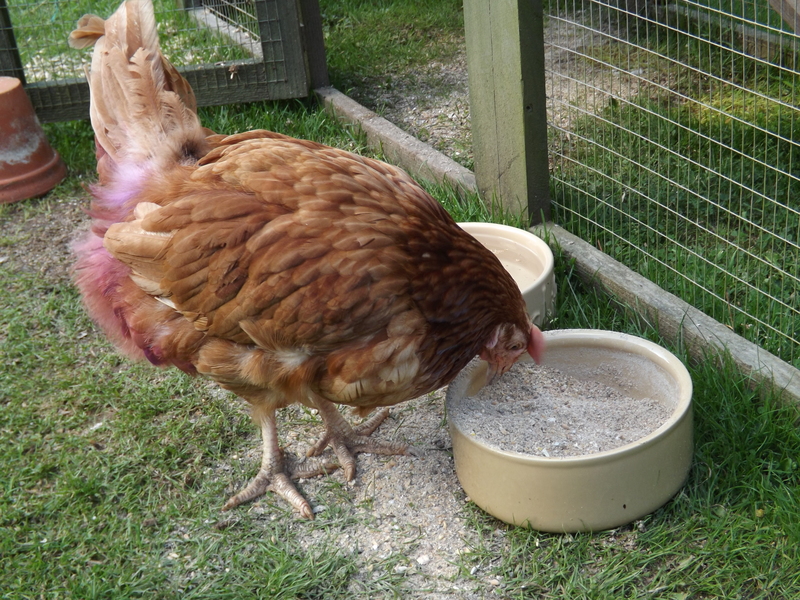 When she was feeling well, Larkspur loved her mash! 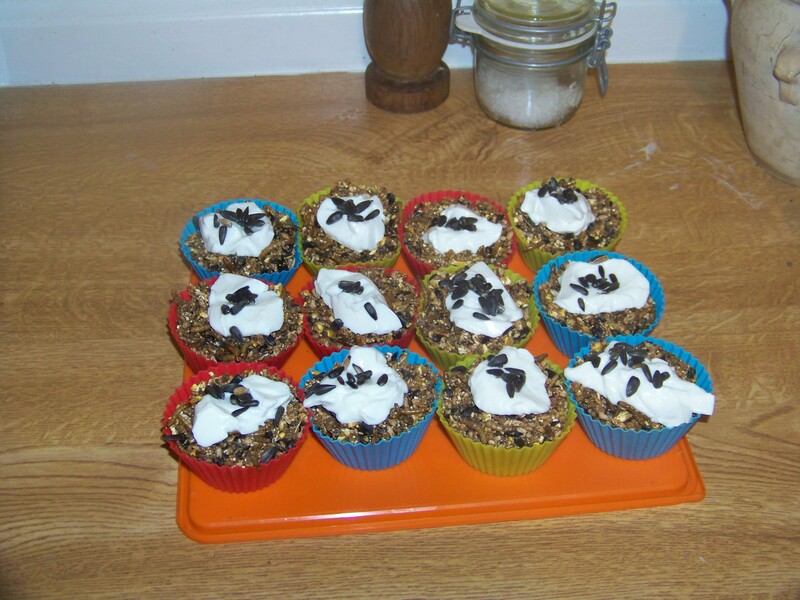 To supplement her medicine, she had a range of vitamins, health foods, digestive aids and treats in a bid to give her body the boost it obviously needed. She was however, starting to slide back down into ill health again and no matter what I tried she would not respond. Looking back there were clear signs and in my heart I knew we were not dealing with a mere infection. The medicine was just masking something very sinister lurking in her poor tired little body. I told myself when we went to visit the vet on that last day that it was just a check-up. She had been dozing in the sun all day (the Cornish weather had, for once, been mercifully kind to these girls) and she put up no resistance as I put her into the carrier. Gina, our lovely vet, found a large tumour in Larkspur’s abdomen and the yellow colour I had told myself was because she had been eating corn, was in fact sky high bilirubin levels, indicating her liver was failing. Looking at her though Gina’s eyes, I suddenly saw how very sick she was, I had been too close, too intent on small details and not seeing the bigger picture. Her body was shutting down and her organs were failing. Sadly, there was only one option and as we awaited Gina and the medicine, Larkspur snuggled into my arms, quite content as I stroked her feathers gently. I believe she knew – she had tried so hard, I had tried so hard, but her scars from her caged life were just too deep. We could not win this battle, no matter how desperately we wanted to. Her passing was peaceful, she stayed where she was in my arms and just drifted off to sleep. The very least I could give her was a dignified death. 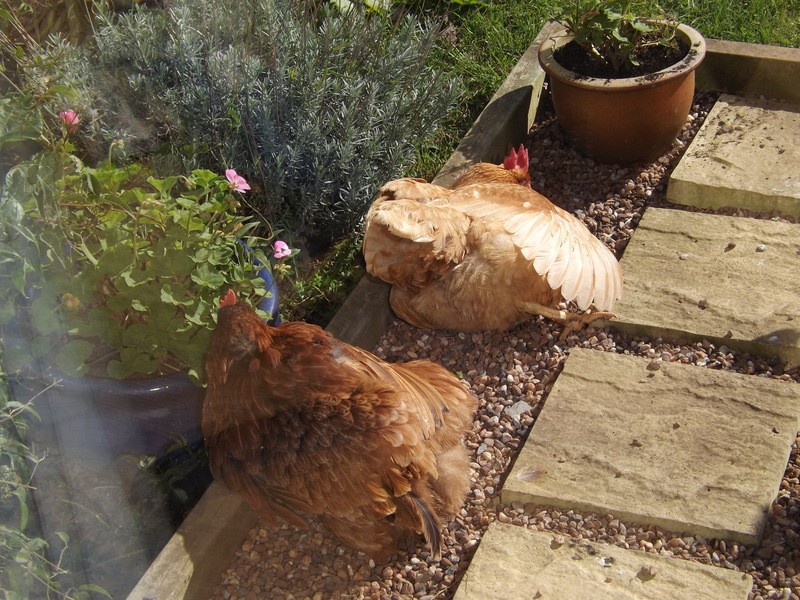 She was cremated with pink flowers under her wings and we watched as her spirit soared heavenwards, finally free of pain, she could now fly high with her Rosewarne sisters – I could feel Bella and Bunty Goodchicken waiting to greet her. 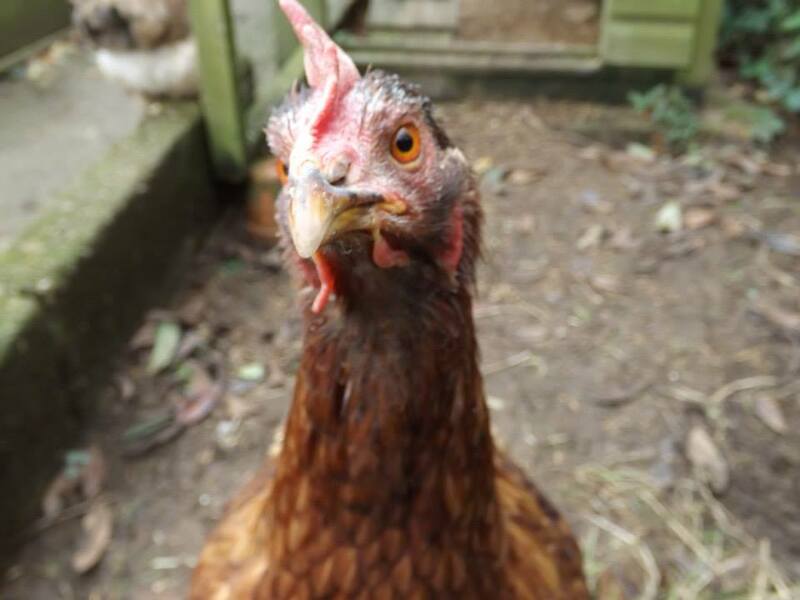 Because she was the sweetest, gentlest of souls she has been awarded the posthumous title of Goodchicken – awarded to only the very best of girls. Larkspur Goodchicken did not deserve to die so soon. She was a victim of a cruel system, her caged life was one of suffering, her body abused … and all for what? She had done nothing wrong, she did not deserve the life she had or the fate that awaited her. Every hen deserves to be free – free of pain and suffering, free to do just as she wishes and free from the abuses some humans inflict on them. Nothing I could do could save her from that, and I tried so hard to save this sweet, sweet girl. And Larkspur had wanted to live so much, she fought with her big, brave heart but in the end her broken little body could fight no more. I could not give her the long free range retirement that she should have been able to enjoy. 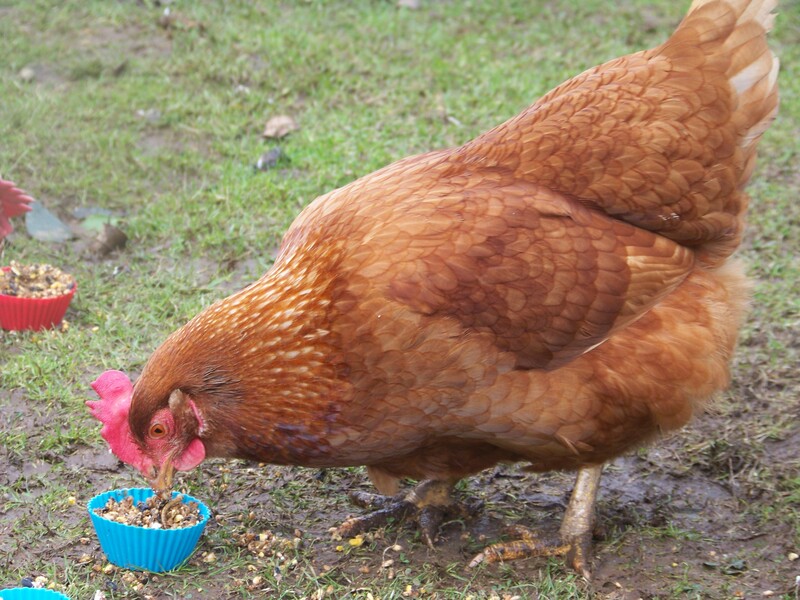 But what I could give her was six weeks of freedom; she knew love (such love), she knew sunshine and friendship, she scratched the grass and she bathed in the dust, she foraged for worms and she pecked at corn. It is nowhere near enough, six weeks of freedom in return for two years of suffering, but I hope she knows how hard I tried for her. Saturday evening saw the grand launch of Uncooped, an online exhibition curated by the National Museum of Animals in Society in Los Angeles. 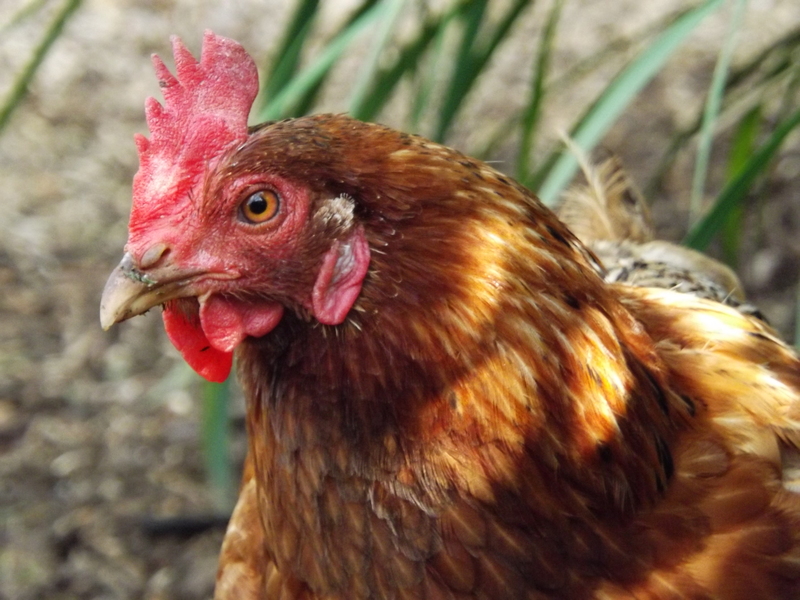 As well as celebrating the beautiful creatures that are chickens, the exhibition highlights the plight of the millions of commercial hens across the world and features pictures and stories of people’s pet hens – showing just what wonderful characters chickens are! We found out about it when my very talented artist friend, Lesley Ann Cooper, was approached by the museum’s curator for paintings and stories. She sent them some of her beautiful ex-batt portraits and then very kindly put them in touch with me for some stories. All joking aside I am enormously proud of my girls for being chosen to appear in the exhibition and I am also enormously proud of the lovely Lesley, whose wonderful artwork makes quite a few appearances. And poignantly a certain Miss Bunty Goodchicken also features in the exhibition. Her story was written as she was slowly losing her fight against the scars her caged life had left on her body. 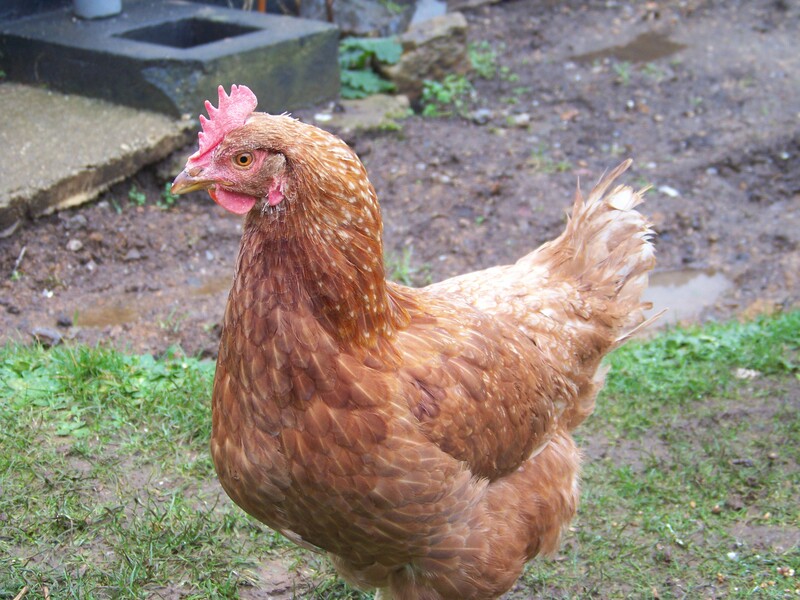 As we still mourn the loss of this most precious of hens, it is reassuring to know that her story is being told in another country; so that more people will read of her brave battle to enjoy a free range life and be inspired by the little hen who blessed our lives for two years. To see Effie, Miss Basket and Bunty Goodchicken go to Get To Know, then Portrait Gallery. Bunty is on line 2 and California Girls Effie and Miss Basket are on line 13. To see Lesley Anne’s artwork click on Advocacy , then Chicken Advocates and scroll down to Battery Hen Rehoming Organisations. 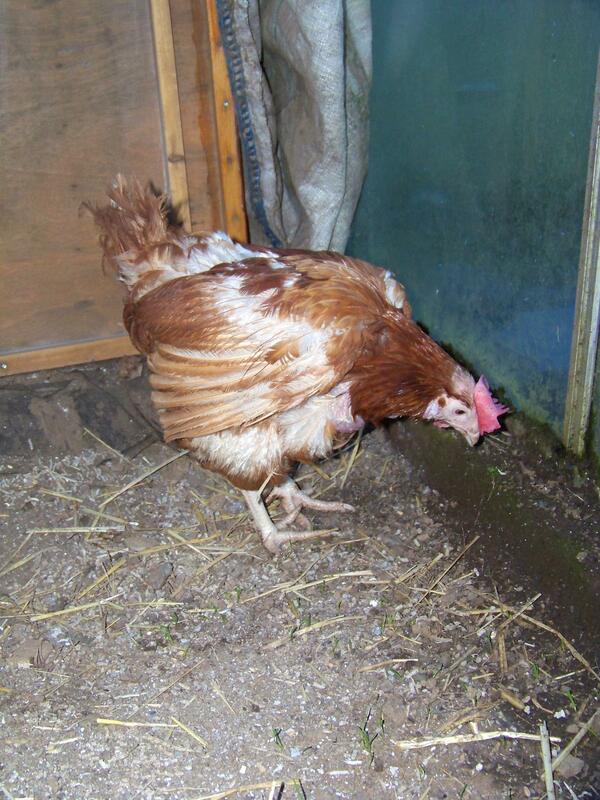 Miss Bunty Goodchicken – rescued 1st February 2011, went to sleep 19th March 2013. 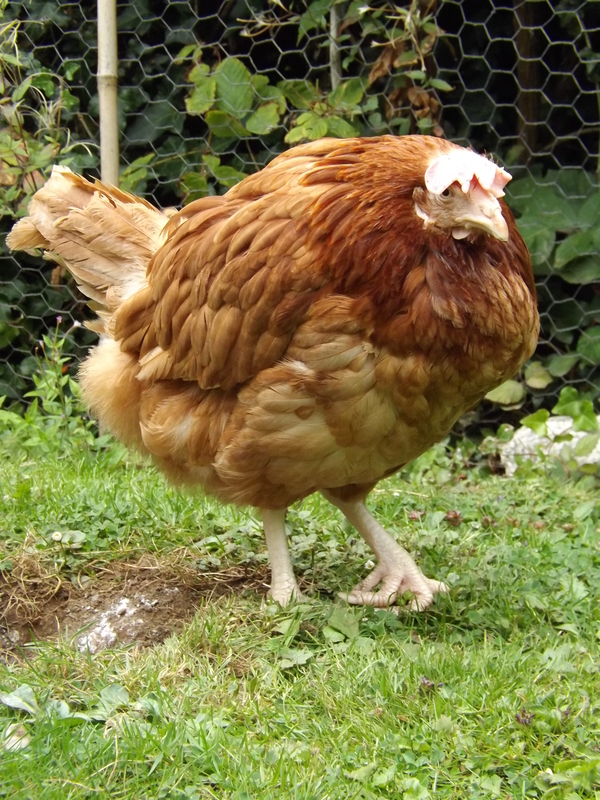 Miss Bunty Goodchicken, arrived in our lives one frosty February, just as the sun was starting to return to our corner of Cornwall. Very apt for a little hen who has brought light into our lives every day since. 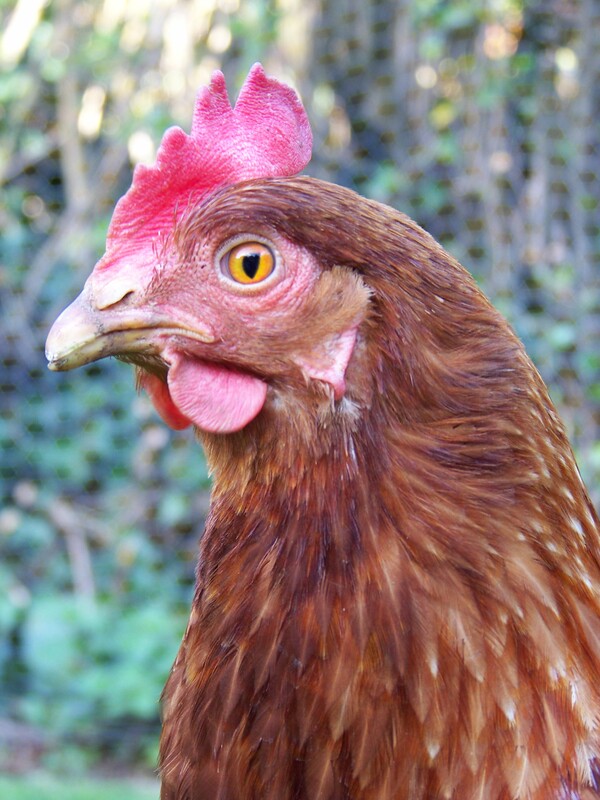 One of our four B-girls, Bunty was a special girl from the moment she was rescued from her cage. Instant best friends with the feisty and soon-to-be-top-chicken Bella, Bunty’s gentle spirit and kind nature meant that very quickly she became Bunty Goodchicken. 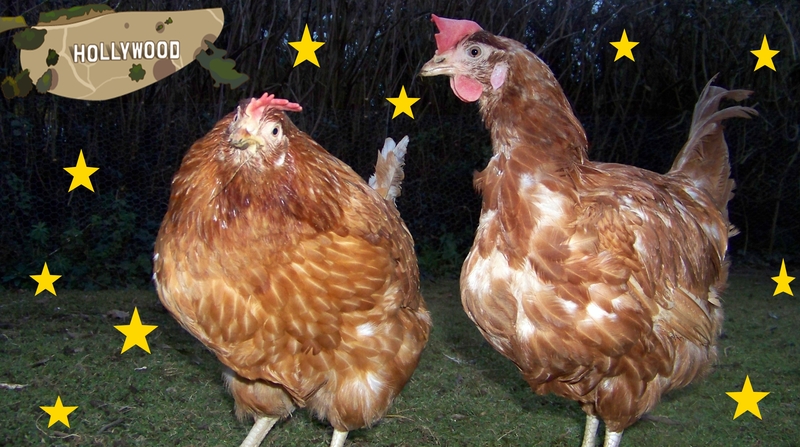 The Goodchicken name is the much-coveted title bestowed on only the most special of hens; whose loving soul is a shining example to her sisters. Never throwing a peck in anger, Bunty Goodchicken was indeed a Good Chicken. 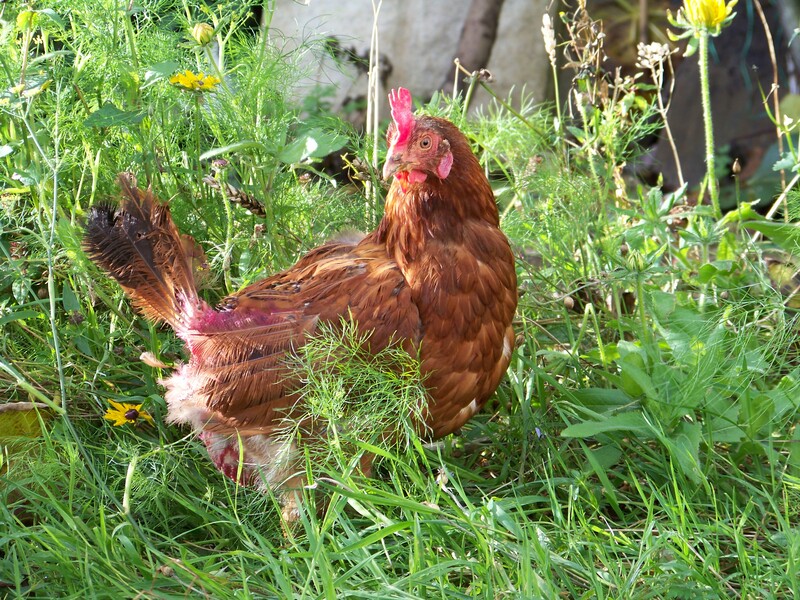 Her first year of free ranging saw her grow all her feathers back and settle into the sort of life every hen should enjoy; sunbathing, worm hunting, foraging, scratching, dustbathing and tucking up snugly with her sisters at night. 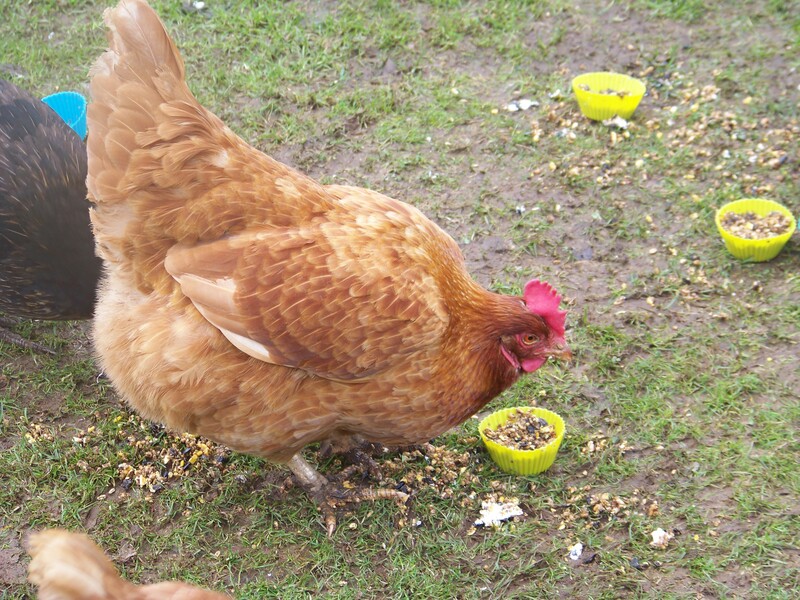 A particularly pretty hen, Bunty was also very photogenic. 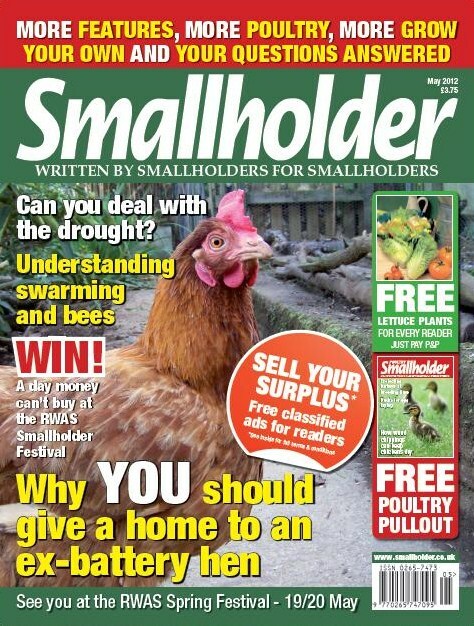 So much so that one of her best photos graced the cover of Smallholder magazine promoting an article on why we should all rehome ex-battery hens. 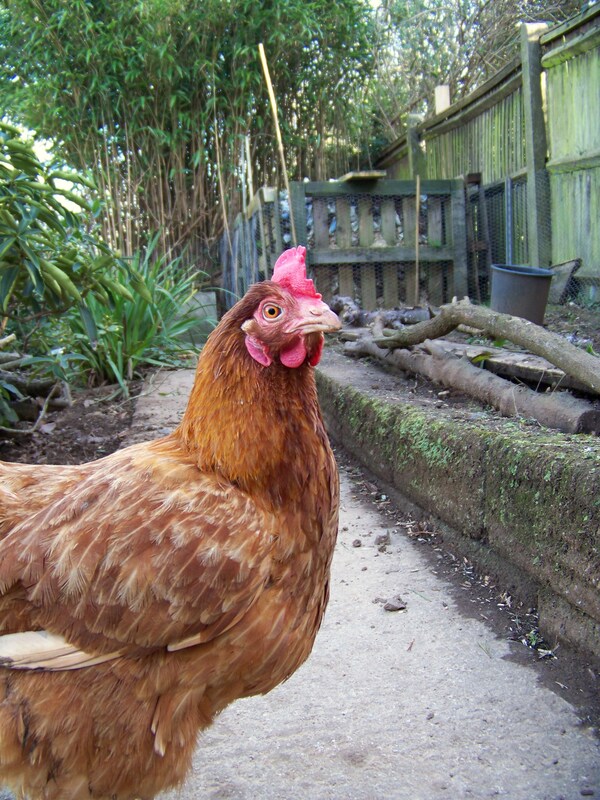 Overnight, Bunty became an ambassador for exbatts and many of her caged sisters owe their new lives to Miss Goodchicken. 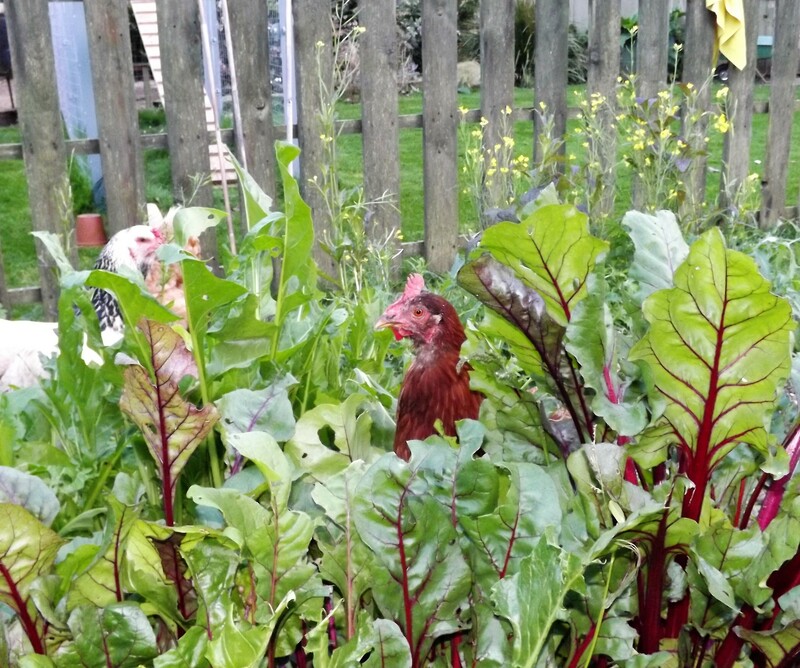 However, at the start of her second year as a free range girl, Bunty Goodchicken became ill. She had a prolapse and no amount of home remedies would help. So off to Uncle Jason the vet she went; the first of many visits and the start of her biggest battle. Bunty had an operation putting in a purse-string suture to keep her prolapse in. She also had a suprelorin implant to stop her laying and thus stop the prolapse re-emerging. After three days of internal check-ups and monitoring, the suture was removed and after a further few days of anxious Prolapse Watch, she was deemed fit enough to return to the loving wings of her sisters. 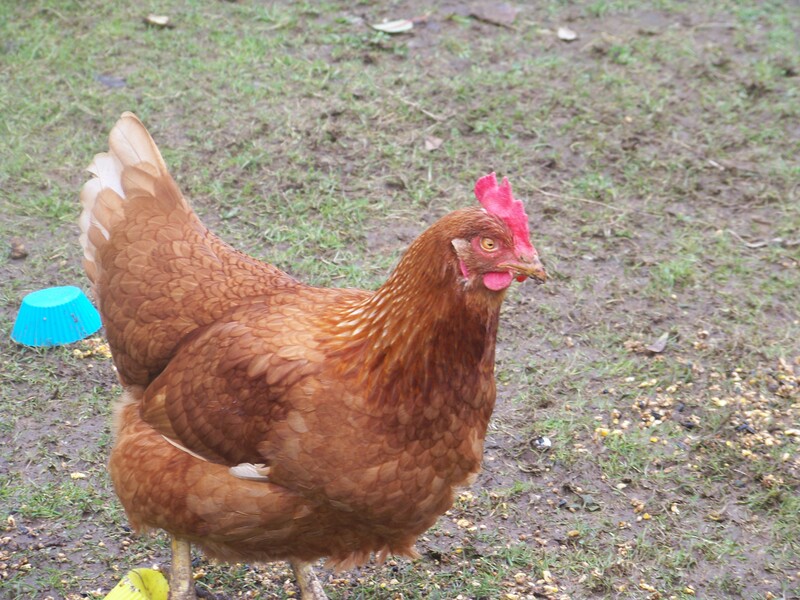 During this time Bunty remained stoic and uncomplaining – a brave chicken as well as a good one. The vets therefore awarded her a Braveheart Award and the medal and certificate are now both very proudly displayed in the human’s coop. However, the battle was not won. 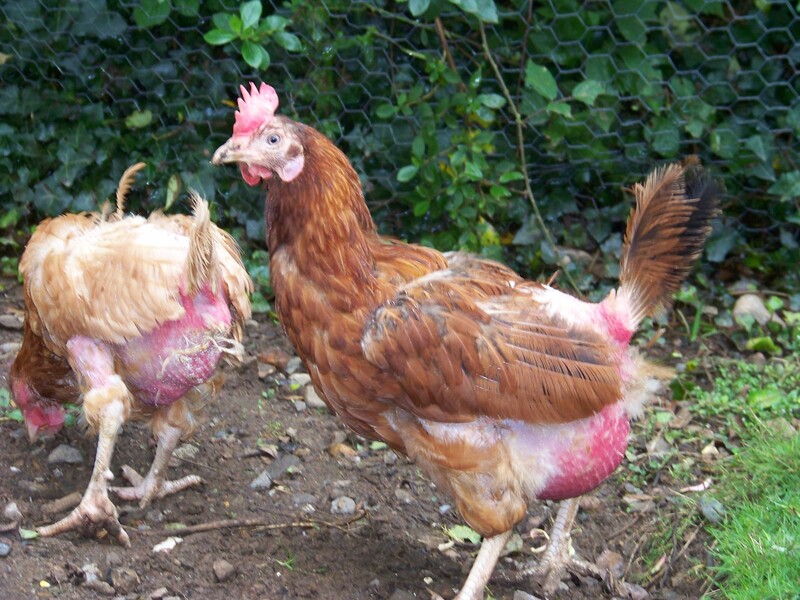 Bunty Goodchicken subsequently developed egg peritonitis – she was laying internally and the egg fluid building up – and was given medication to relieve this fluid build-up. At first she happily took her pills, ground up on a delicious treat, but she soon got wise so it had to be syringed in along with a painkiller. For over a year, this precious girl was kept alive by her various pills and a couple of sessions draining the fluid from her abdomen. She remained her normal happy, chirpy self and enjoyed her free range life to the full. 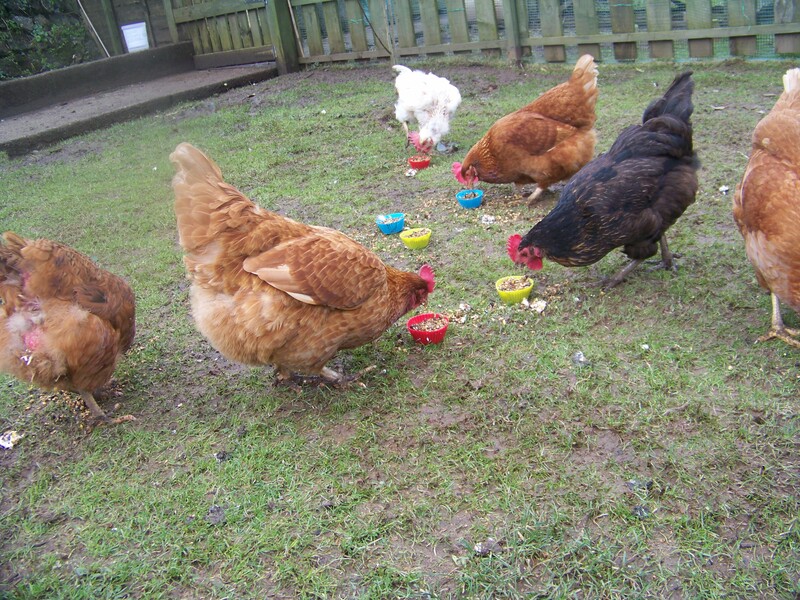 After the sad passing of two of her B-sisters (Bertha and Brigit), Bunty Goodchicken and Bella became firm friends with Clara and the three were inseparable. During this time, Bunty Goodchicken became a household name. Not content with being just a covergirl, she also appeared in a chapter of Tales From the Coop, a book by the lovely Sophie Mccoy to raise money for exbatt hens, and most recently she has cracked the American market by having her story, photo and portrait appear in an exhibition in the National Museum of Animals and Society in Los Angeles. However, slowly Bunty started to worsen and in an attempt to keep her precious life going a little longer, she trialled a pill to help relieve the pressure on her heart. Uncle Jason, amazed at how Bunty Goodchicken had fought to stay alive against all the odds, is currently writing a paper on her treatments. 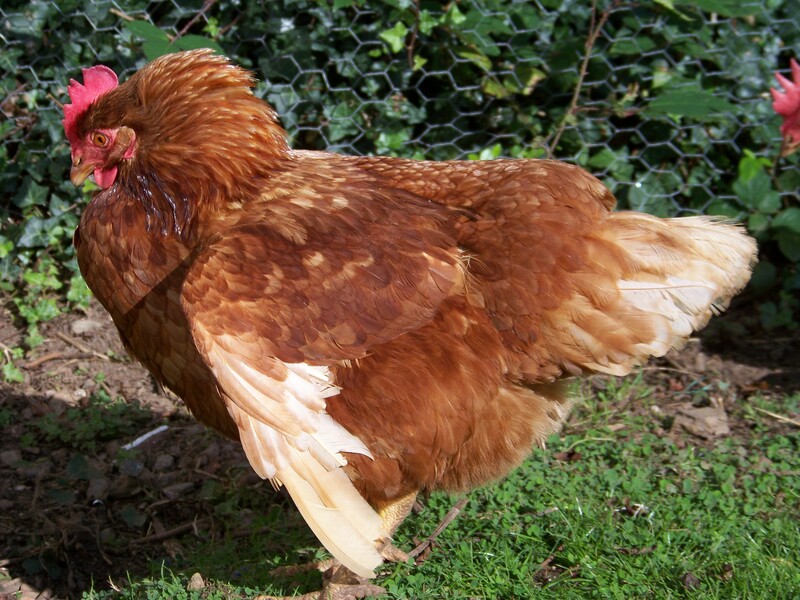 Due to his work with Bunty, he has subsequently been able to successfully treat many more hens. So she is also a medical pioneer. However, she was not getting any better and we went to see Uncle Jason with that dreadful dilemma. Was she suffering? Were we prolonging her life just for ourselves? Could she live a little longer? It was a decision I wasn’t brave enough to make, so my darling Bunty, a Goodchicken to the end, made it for me. Whilst we were at the vets she started to fit and within seconds her heart had given up and she died in my arms. Her big, brave, beautiful heart, full of love and goodness to the very end, had finally decided it was time for Bunty to rest. And it is now our hearts that are breaking. 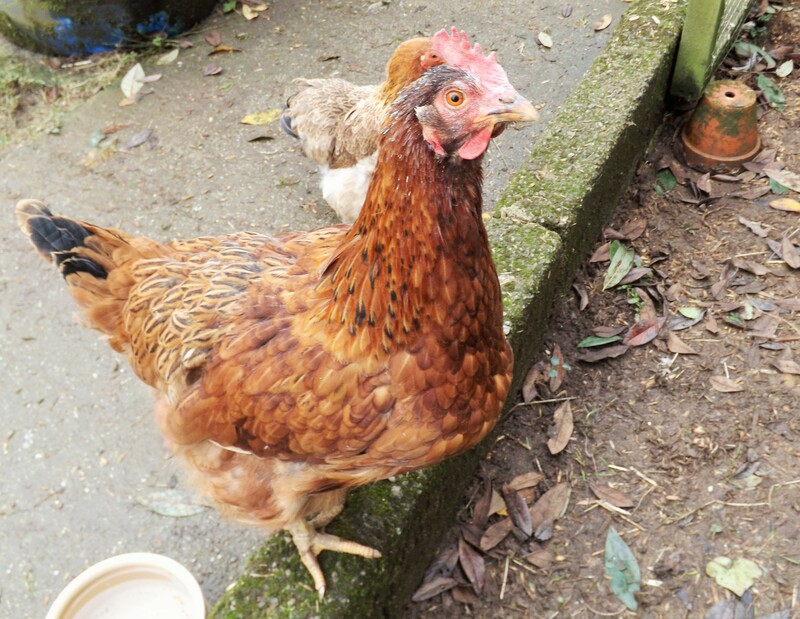 But as we said goodbye to our girl, her spirit soaring to the heavens, we took a little solace in all the hens our darling Bunty Goodchicken had helped to save. 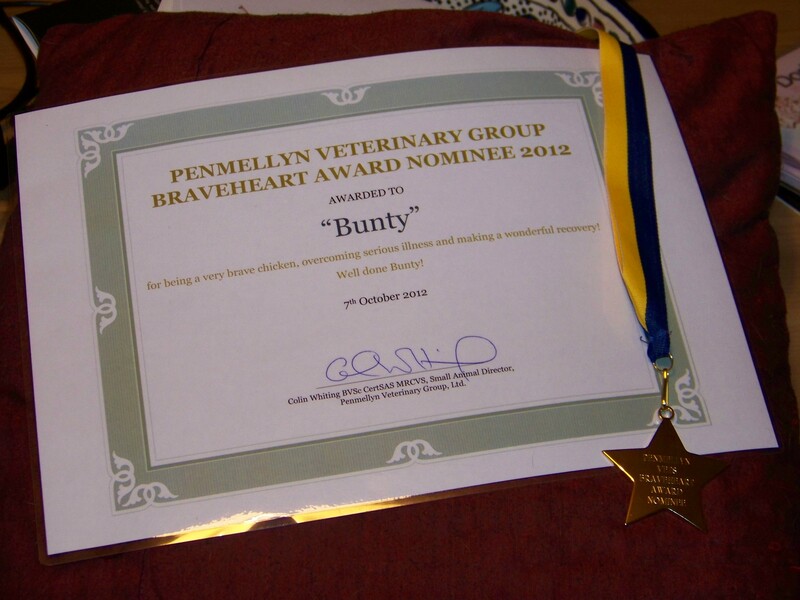 Miss Bunty Goodchicken: Covergirl, Exbatt Ambassador, Braveheart Award Winner, Medical Pioneer and (very) Good Chicken. A big legacy for a little chicken.